Welcome to our 65th Season: Let’s Go! Whisk away on a family adventure around the world without heavy luggage or cramped airplanes. Let’s Go! is the theme for Honolulu Theatre for Youth’s 65th season that will transport audiences around the globe and back in time to Korea, Japan, Tasmania, post-war New York, the kingdom of Hawaii, and more. Underlying the humor and excitement of each play are themes of resilience, love, friendship, and courage that will hit home. 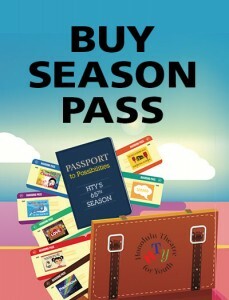 We hope you will consider joining HTY for the entirety of our 65th Season. Season tickets save families up to 25% off of admission, help support HTY and most importantly, carve out creative time for your family to laugh and grow and share stories throughout the year. To accommodate busy family schedules, a new Sunday afternoon performance has been added. Season tickets for the entire seven-play season are on sale now and remain the same price as the previous season: $105 for adults (age 19-59), $55 for youth (18 and under) and $80 for seniors (60+). A Pick Five package is also available. BUY NOW, RESERVE LATER option, which allows you to schedule each performance individually. As always Season Tickets offer great savings off our already reasonable single ticket price (up to 25%).